River City Blackhawk: Hey, It's Heritage Classic Weekend! Hey, It's Heritage Classic Weekend! 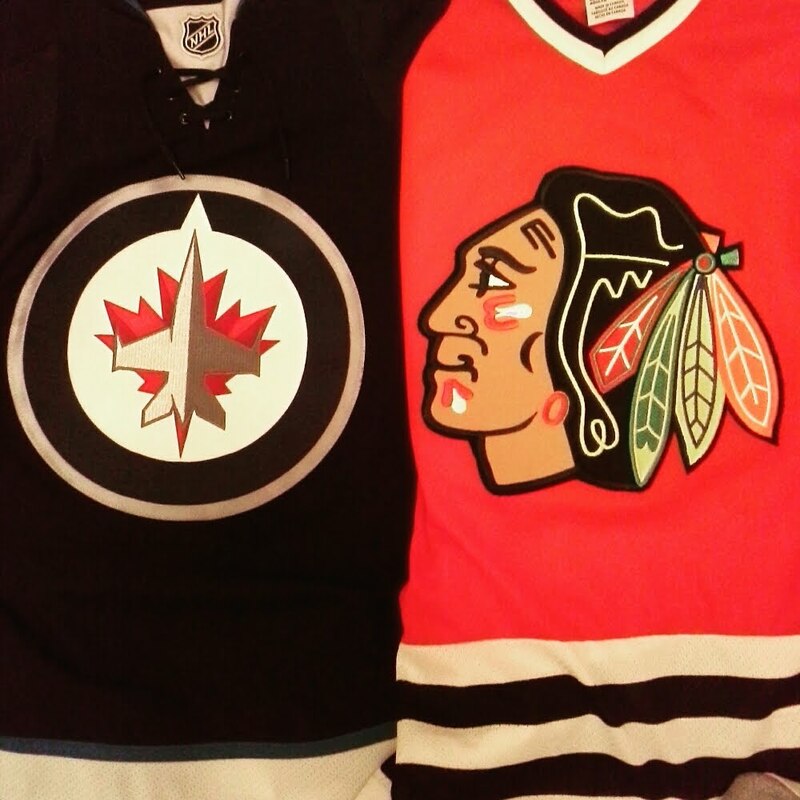 If you're a hockey fan in Winnipeg young or old, this weekend will be very special for two very good reasons. The NHL Heritage Classic game between the Winnipeg Jets and the Edmonton Oilers feature two of the rising stars of the league, Connor McDavid and Patrick Laine. The game will take place outdoors at the Investors Group Stadium on Sunday, October 23rd at 2:00 pm in the afternoon. 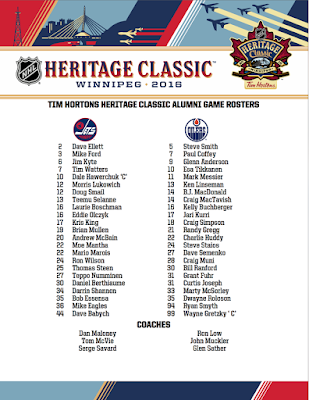 This weekend also highlights the Heritage Classic Alumni Game between the Jets and Oilers alumni featuring Hall of Famers and superstars from the 70's, 80's and early 90's on Saturday at 3:00 pm. If you are of the older generation, like myself that grew up with Jets of the WHA and the Winnipeg Jets of the NHL (first edition) before taking off to Phoenix, the memories of our beloved heroes from the past will make for a nostalgic couple of days. I will be posting on Twitter, Instagram and Facebook old Jet memorabilia that I had collected back in the day. Unfortunately, I won't be attending either game (yes, it's because I'm cheap! ), but I will be reminiscing in front of my TV with a pot of hot chili, cold beer and a plate of Dale Hawerchuk Monster cookies (more on that tomorrow) enjoying the spectacle of the Heritage Classic. The allure and novelty of the outdoor has almost worn it's welcome with me, but the fact it's in Winnipeg will be special. Sit tight and stay warm, but if you want to be part of the excitement and participate in the events this weekend, note the times and dates below. 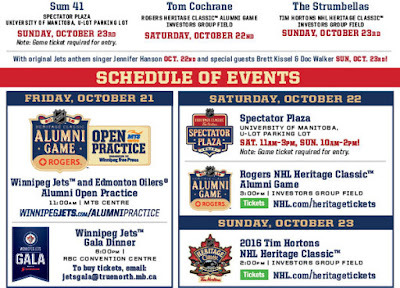 For many, the big attraction to the weekend will be the Alumni Game that features such greats as Wayne Gretzky, Dale Hawerchuk, Paul Coffey, Teemu Selanne, Mark Messier, Dave Babych, Jari Kurri, Grant Fehr and many more. I'm sure the quality of the game itself won't be the end to end scoring sprees of the past, but it will definitely satisfy any hockey fan that grew up with these guys. And the retro Jets Heritage Classic jerseys look awesome!! This game will attract national attention and in many ways might be a better draw than the game on Sunday. I'm not sure how ticket sales are going so far, but you can now purchase each game individually instead of the previous package deal that included both games. 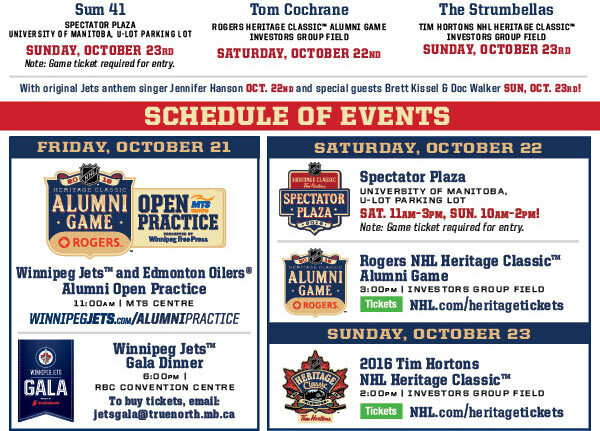 I'm guessing the big price tag for a wholesale (cheapskate) city like Winnipeg might have scared some fans from attending, so splitting up the games will be a way to sell to the fans that have been whining that they only wanted to attend the Alumni Game or the regular Heritage Classic game. Should be interesting!